Deception is the greatest crisis facing the world. Few believed the 911 Commission's official report, choosing instead to believe in a controlled demolition of the World Trade Center. Likewise, many believe an invisible global government is controlling the world with false flag Islamic terrorism and perpetual race wars. Meanwhile, papal Rome continues her deceptive piety and pageantry, even though she branded millions as heretics, burned them alive, stretched them to death, fed them to wild animals, and subjected them to all manner of unthinkable torture during the Dark and Middle Ages. The deception ends with Power to the Papal, the explosive synopsis of author Ilise Sorele's ten years of research into the Bible's present truth for our generation. Her investigative report calls for a revolutionary revival in light of the impending global conflict with Public Enemy #1. Therein, she exposes the identity and designs of this non-Catholic, enemy hiding within papal Rome as it plots to set up a centralized global government and rule the world from Jerusalem. 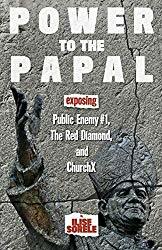 The author further exposes that ChurchX, entrusted with the vault of present truth, has gone rogue and will be destroyed for her corporate sins, like the city and temple of Jerusalem in A.D. 70. The Red Diamond is revealed as the true identity of the Holy Spirit, crucial to overcoming sin until Christ returns and defeats Public Enemy #1. This important book is destined for the secret vaults of genuine truth seekers. Power to the Papal describes author Ilise Sorele's journey as a former member of ChurchX. A seasoned writer with degrees in journalism and legal studies, Ilise currently resides in the San Diego area, where she enjoys temperate weather and stunning ocean and mountain views. However, the days are fast approaching when she will eventually have to seek refuge in the mountains due to the impending global conflict described herein.